It was in the midst of all the joy and daisy field carousing that we got an email from our boys’ doctor. The doctor who corrected Jude and Shepherd’s clubfoot. The doctor we absolutely adore and whole-heartedly admire. And he had some serious reservations about this little girl. He wasn’t 100% certain what her condition was, but he said that he felt her clubfoot was ‘syndromic’ (part of a syndrome), not idiopathic. And that additionally, her arm deformity might be quite complex. Honestly, I don’t know what I was expecting to hear from him? But it definitely was not that. It felt like a one-two punch in the gut. My husband, on the other hand, was completely unfazed. He knew God intended her for our family… and that was all he needed to know. I pressed our doctor and told him that we intended on bringing this child home, how much we wanted to adopt her. He replied, in the most sincere and loving way, that the he felt her needs were too much for us. I cried. I cried. I mourned. How could this be? Suddenly, the little girl I’d become so enamored with felt like a million miles away. It became impossible to look at the sweet face staring at me from the refrigerator door. I wanted to resist her, to resist this process. I felt like I was drowning. I went to my husband, more than once, and cried to him. I knew that any of her needs exclusively we could handle. But how could we adopt a child with this many special needs?? This many unknowns?? I poured my heart out to him and told him I could not be responsible for the decision to bring this little girl home. I just could not. I asked him if he was willing to carry the burden of the decision. 100%. “Can you do that?” I asked, without any idea what his response would be. Somehow, neither possible answer would have brought me any sense of joy or peace. He said yes. We inquired with our agency as to her HepB status since this was not listed as a diagnosis. It would be a few days before they could get a response back from C@AA, we’d have to wait. Some how, some where during those few days, the skies opened. The rain stopped. And my husband’s certainly filled me with a knowledge that this was our child. No matter what. When we heard from our agency that it had been a translation error, that she did not have HepB, we were overjoyed. And we celebrated the fact that our daughter didn’t have HepB. We celebrated for her, that she had one less obstacle to wrestle with, one less burden to carry. We celebrated for us, that a huge weight had been lifted from our shoulders. And we felt even more certain that we could parent this child and provide for her in every way. Since then we’ve been on a solid high. God is so good. He allowed me to struggle through a time of anxiousness, of doubt. And on the other side, looking back, I am grateful for every tear I cried. If I hadn’t experienced that sorrow and uncertainty, I wouldn’t know this measure of joy and assurance. We have since received so many confirmations that this little girl is meant to be ours… crazy confirmations that could only come from the Big Guy, Himself. God has truly showered us with reminders that His plan is perfect. And that His plan for our family includes this precious, beloved little girl… this little girl to be known as Vivienne Kate. Thank you SO much to my incredibly talented friend, Rebecca, for this beautiful announcement! We had to take out some of the pertinent info, unfortunately, but you get to see the best part… her precious little face!! & there SHE IS! Straight up, carebears & all!!!!! I am in the midst of Esther & Beth Moore reminded me this week that GOD IS WHO HE SAYS HE IS!! ALL the TIME!!!! I am so blessed to have read this faith story this morning! Go GOD! She is beautiful and I am so glad for her and for ya’ll – praises to the LORD. She is so beautiful and she looks just like your daughter. That is so beautiful. Isnt’ it amazing when God gives you what you need, even if you don’t know you need it at the time and it also hurts? She’s an absolute beauty. God will provide. He already has. Vivienne Kate–what a beautiful name! Thank you for sharing her story. I am so inspired by your family. OH!! What a sweet baby…and adore the name! God is good and he makes his purpose CLEAR!!! She WILL BE a blessing to you all! AND YOU a blessing to HER! Congratulations! So happy for you. Vivienne is adorable. What a precious little one! I can see why you fell in love with her from the minute your eyes saw her. Can’t wait to read more of your adoption adventure. Would love to know how you informed your kiddos of their new soon-to-be sister. PS – Love the name!!!! What an awesome post! When I read her name I had chills go up my spine, a beautiful name for such a beautiful girl! God’s love is truly amazing and He’ll provide all that is needed. We just need to trust and follow. You’re such a testament to His word! What a blessing she’ll be to your wonderful family! What a wonderful gift you will be for each other. She is just beautiful!! We are so happy for you guys!!! Isn’t our God just amazing?!?! She is an absolute doll. You story (your life) inspires me so incredibly much. Thank you for sharing. She is just precious! I’ll be praying for you all! Absolutely beautiful!!!!!!! !….love the Care Bears blanket! Praise the Lord for your husband’s strength in standing firm for this precious little one. I can’t wait to follow along on the journey. She’s beautiful! And I love her name. She is beautiful–thanks for sharing the story. Looking forward to reading more about your journey to this precious baby! Thanks for sharing the emotions, ups and downs, and just know you are such an inspiration!!!! Praying for a joyous journey to bring your new daughter home. A beautiful name for a beautiful girl. Congratuations! I know she will flourish in her new home with your family. Well I have to say, you have started my day off GREAT….thank you for sharing your story with us, it has truly touched and blessed my heart! Vivienne Kate is a beautiful little girl!!! And I LOVE the name!!! We have a Vivian Josephine, we call her Vivi Jo most of the time. I shared with you before how God used you and your blog to direct us to our precious daughter….again thank you for that! And thank you for hearing and responding to God’s voice, to bring home this precious precious baby girl….another child that will no longer be an orphan and will be given a home full of love! Blessings to you and your sweet family! From where I sit, her arm issues aren’t really complex…..since she has two arms! (my Mia has only one arm) Seriously, though, I’m not making light of this–it’s obvious that God showed up BIG for y’all and I couldn’t be happier for you! What can I say but God is faithful? I too have poured over medical info on a little one with WACAP…consulting a specialist and praying for direction. God was faithful and He said no…this was belongs to another. I am so thankful that we have a God Who speaks to His children…that we can obey Him and live according to His purpose for us. 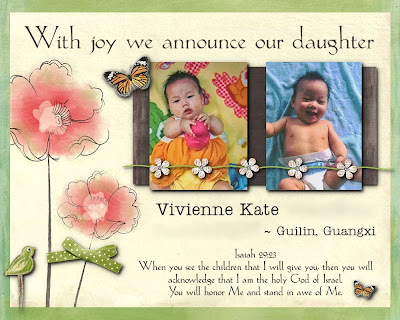 Vivienne means life and Kate means pure…I have no doubt that this little one will be given a new life through your family….and one day through her Savior. And what could be more pure than this? Vivienne Kate is beautiful and I love how you and your husband were led to her! She is definitely your daughter!! Congratulations!! I’m just so happy for you all, what an incredible journey you have been through so far. Your youngest daughter is just so beautiful, it’s easy to see how she captured you… that and the babbling when her name is called. Speedy Travels!! She just looks like she belongs in your family! She is absolutely precious and I love the name you have chosen for her. Thank you for sharing another beautiful journey with us! Oh Stef…she is absolutely beautiful! I am so thrilled for you guys!! Congratulations! What a gorgeous baby girl. I’m completely biased, but I think Guangxi girls are pretty special. I think with ALL labs from China, you have to take them with a grain of salt. I know numerous people who’ve brought home non-special needs kids who actually have Hep B, and others who’ve brought home kids who supposidly have Hep B but really don’t. Either way, it’s a special need you absolutely could handle. I consulted with your Iowa doctors once about a boy with club feet. He also had hand issues. Dr. Ponsetti felt it was beyond what they normally treat and that he didn’t think he’d be able to get a good result. I too was so upset. Arthrogryposis was his thought. That little boy has been adopted and I hear he’s doing GREAT–just a complete joy to his family. Sometimes what isn’t right for some (at least at that time), is perfectly right for others. Once you have a confirmation that you’ve made the right choice, you just have to sit back and watch the blessing unfold! She is soooo beautiful…and has such a precious smile!! Oh, and I forgot to mention – SO LOVE the name Vivienne! WHAT a story! An awesome God indeed! Congratulations to you and your family. She is beautiful and her name is lovely. Your new daughter is beautiful!!! I am at work with tears in my eyes and my heart is filled with happiness for you. Ohhh Vivienne is absolutely beautiful!!!! Thank you for sharing her story. Congratulations!!!!! Speechless except to say GOD IS SO GREAT AND GREATLY TO BE PRAISED!!! I’ll say it again, I am so EXCITED for you and Chris!! SIGH. Finally, a post without snatching my breath at the end. SIGH. She’s gorgeous. Love the hair. And congratulations to you ALL – your commitment to hearing God’s voice, surrendering to His Will and letting hubby lead the way are all inspirations to me. You are an amazing woman, and I have no doubt that Vivienne will become an amazing woman under your leading. Thank you for sharing the whole story. I’m humbled and blessed. Congratulations!! You are an amazing family and I can’t wait to see Vivienne amongst your faces when I click on your blog everyday! congratulations!! I know that the adoption roller coaster is just that… a bunch of highs and lows. The important thing is to take a deep breath and know that if God gave you this child that anything not found or found within her little body, there will be strength from GOD That IS found within your body for her! We as adoptive parents thousands of miles in a different land can only know so much about our children and so can our doctors. BUT one thing I know from Jeremiah having had minor special needs according to the U.S. but no special needs according to Taiwan, we KNEW that he was ours and we are so grateful we obeyed. Even now with his new diagnosis of Cerebral Palsy, God chose the perfect child for us!!! so rest with peace in your decision and love that precious little girl!! She will be perfect for your family!!! God is great and promises us no more than we can handle!! And this precious little girl is going to bless you!! SHE IS AMAZING!!!!!!!!!!! What a beautiful name for your sweet daughter. It is so wonderful to see God working through your family. I am glad he opened your heart once again to provide a loving home for one of his children. You have an amazing family. I am sure your sharing of this story has and will touch the lives of many. It is a true gift you have given to others. What a beautiful little girl & I am so glad that God confirmed that this IS your daughter. Oh Stefanie…she is just absolutely precious and looks like she just BELONGS with you!! What a precious gift she is. Her beautiful name fits her perfectly. Thank you for taking time out of your busy life for letting us all in on the awesome story of your journey to your newest baby. I would love to know your kids’ reaction to your great news and also how you handle some people’s negative reactions (because not everyone “gets it” of course). Anyway, CONGRATULATIONS! God is blessing you once again! Coming out of Lurkville to say congratulations and that they don’t get any cuter than that! Thank you for sharing your story. CONGRATULATIONS!! She is beautiful, and you’ve picked out a beautiful name to go with her beautiful face!!! A beautiful, BEAUTIFUL, child! Congratulations from one Guangxi Mom to another! What an awesome God we serve!! Such a beautiful baby girl. Love the name. Praying the chase goes quickly and without any hiccups along the way!! She is so beautiful:) What a wonderful addition to your family. Cannot wait to follow your journey, AGAIN, to bring her home. If I could just stop crying for one second, I'd tell you how beautiful she was and what a touching journey this will be. Congratulations! Vivienne Kate is so beautiful!!! What a perfect addition to add to your quiver! We went through a similar VERY LONG weekend when we were trying to lock our little girl. (The CCAA’s web site went down on a Friday afternoon!) And the first doctor we contacted was very negative. But God… I love that phrase…But God…kept the door open for our precious girl and spoke to our hearts. We knew that this little girl was our Maylie. Your blog is such an inspiration! I’ve been following for quite some time. Our EA went in on Jan. 12th. Hey, we might be traveling to China around the same time! Blessings to all of you and congratulations again! Congratulations!! She is an absolute cutie!! She is lovely, and she is blessed with two really amazing parents who listen to an awesome God. Oh Stefanie – she s simply magical. Precious just isn’t a strong enough word…maybe perfect is better. I am so enamored with your strength with God. I only wish and pray that am able to listen when He is talking to me. I don’t know if you remember me, but I was the girl with the art project of China. But I just wanted to say congrats on your little one! How exciting! Vivienne – I don’t think your family can wait to get you home! GORGEOUS! GORGEOUS! GORGEOUS! God is so good and when you let Him lead, the dance is always a perfect 10! I am so very happy for all of you. YEA! A Guangxi baby! I tell you, this gets better and better! My daughter is from Guangxi!!! We still have ours days when we scratch our heads and wonder how God made this girl for us. We are, and YOU are, so blessed! Thank you for the tale. Absolutely stunning…another beautiful daughter for your beautiful family. You are so blessed! You seriously have some of the cutest kids ever! Congrats on your new baby girl. What a beautiful story, Stefanie!! Your BFF is a pretty awesome guy and Vivienne Kate is just precious!! first, she is as precious as they come! and i am chanting "more photos! more photos!" i've been praying for her, but please let us know if you have specifics to pray for her. second…your dude rocks. aren't you glad that God made men the way He did. i love the conviction and steadfastness that chris showed through this all. tell him i am singing "we don't need another hero" while i think about him…chris is hero enough!!!! yes, come to CA with me! i want someone to give me a huge house on teh beach to turn into a free B&B for special families…like those who adopt SN or those whose kids are ill! OOOPS! that last post by “scott” is ME!!!! Congratulations!!! As with your previous adoption journies, I look forward to following along on this one too. What an inspiration your family is to so many others. And of course, I love the name!! Although my Vivi’s name is not short for “Vivian/Vivienne,” I love that name as well! Oh Stefanie, I am so, so very happy for you, for your family, and for Vivienne Kate! You see, the very first SN file we ever looked at was her! She was listed with Faith International last month, and we decided review her file. Well, she is stunningly cute and irresistible! We stared at the photos for a long while, particularly the one where she’s sitting up outside on the Care Bears blanket and the one where she’s lying on her belly reaching toward the camera. But I just knew she was not our child. I think her needs were a few too many for us, as first-time adopters, and that little voice in my head simply said she is not the one for us. But I had such a peace about it, and told my husband that I knew God has big plans for her. I have been praying each night for her to be matched with a wonderful family. Well, when I was reading your story, I kept thinking that the special needs and province sounded very familiar, and here she is the same baby! I am so, so thrilled that you are her family!! God is so good!! This sweet, beautiful child — Vivienne, such a lovely name — will be part of your amazing family, and I could not be more happy for you all!! Thank you so much for sharing! I will continue to pray for her and for all of you as you become a family of 11! Faith…a story FULL of Faith, not to mention HOPE & LOVE…& the greatest of these is what your entire family LIVES! God bless you as you embark on this special journey to bring your daughter home! We'll be praying along side you!! Tears and tears of joy….so very, very thrilled for all of you – your family and your precious new little Vivienne Kate! I was on pins and needles following your story. You are such an incredible woman (and writer!) I am in awe of you and the amount of love you and Chris have in your hearts. Vivienne is in for a journey of a lifetime. She is just beautiful and I look forward to following you to her every step of the way. that is just a beautiful story! Congratulations, Stefanie and Chris! Gotta love those Guilin girls! You know that Vivienne Kate is being LOVED and cared for and that means so much! Our family is absolutely THRILLED for all of you and for Vivienne Kate! God bless you on this journey! We can’t wait to follow along ! Stefanie ~ Beautiful story. Beautiful girl. Beautiful family. Beautiful Lord. My heart literally leapt when I realized I was scrolling down to SEE HER!! She is gorgeous! More importantly, she is your daughter, a precious gift God saved just for you! Praise Him for knowing where and how our children will come to us, even when we are unsure of His plan. God Bless Vivienne – Off to add you all back to the prayer chain!! Congratulations! Vivienne is so beautiful!!! Wishing you all the best in your journey to bring this precious little being home! Oh, she’s beautiful. Another beautiful daughter to join your beautiful family. Congratulations! My cousin’s son was born with a syndrome and has issues with all 4 limbs. His son has club feet…I will find out the name of it for you! She is so beautiful! Congratulations! I will pray for you as you start your new journey back to China!!! She is a beauty and you are blessed!! Congratulations on your beautiful new daughter. May God bless your journey back to China. Can’t wait to follow along! Dear Stef – It’s been forever! I’ll have to email you sometime soon to catch up. And I KNEW as soon as you posted the 9 balloons what it meant….just didn’t know if it was a boy or girl! 🙂 Congratulations to you and your sweet family on your new adorable daughter, Vivienne! HUGS! Oh she is so beautiful. I loved reading the story of how God showed your daughter to you. You and Chris have incredible faith and love. Congratulations. Your family is so blessed. Congratulations!! A new baby girl! You are a wonderful family! Vivienne Kate is so beautiful!!! What a sweet, precious blessing – thanks for sharing your journey of faith. I’m so very happy for all of you! Wow did I have a lot to catch up on!!! What excitement! What a beauty! Congratulations to her and your family!!! btw, God will take care of you as you care for her. He is the supplier of all our needs and He is the Great Physician. :O) but ya already know that! Sweet name.. love it. I am currently trying to talk my children into naming one of my futre grandaughters Kate. One of my favorite names. .. I just feel like there is a kate out there for us.. but hubby says we are DONE.. sigh. She is so cotton-pickin’ cute I could just cry…as I’m sure you have! Congrats and hugs all over the place! She is beautiful! Congratulations! Our daughter is from Guangxi, too! Thanks for sharing your heart with us! I followed your blog from PW. I just wanted to hop in and tell ya…that your little girl shares my great grandma’s names. Vivienne was my mom’s grandmother and Kate was my dad’s grandmother. Oh and I’m also adopted. CONGRATS on your baby girl! She is beautiful and precious! Congratulations!! God is soooo good!